If you use texture sheets or rubber stamps to make impressions in polymer clay or another medium, you already know they can get pretty expensive. In addition, that pricey special theme stamp or texture sheet may only get a single use. There’s an easy way to get detailed impressions in clay without spending a fortune on texture sheets and rubber stamps and you don’t have to be an artist to do it. You can create your own impressions with nearly any design and any size you choose. The stamps you create will cost pennies because all you need is card stock and polymer clay... And maybe a craft knife. A Silhouette machine would be an added bonus. This tutorial will help you to create both positive and negative impressions. If you are unsure about what this means or why it’s important, it will become clear as you read the steps below. Quite simply, a positive image would be one that is raised above the surface of your project. A negative image would be depressed into your project surface. step 1 - Search for images online with the keywords "stencils". 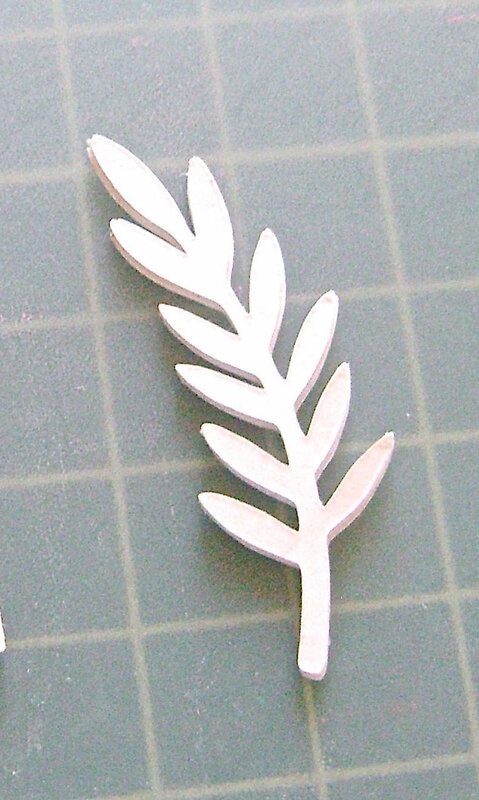 For instance, if you want to create a palm leaf stamp, do a Google image search with the words "palm leaf stencil". There are many sites offering free stencil designs. Find an image that you like in the results and print three copies of it. It is your responsibility to determine if the image is in the public domain and if you can legally use it. If you have Photoshop or another image manipulation program, before you print, you can import your image and alter the size to suit your particular project. Actually, you can even accomplish this in Microsoft Office. step 2 - Use a craft knife to cut out the image or bring it into your Silhouette machine to cut it. You can either cut three identical copies of the image then glue them together with paper glue or spray adhesive, or you can glue three sheets of card stock together then cut out the image with a craft knife. When using paper glue the card stock must be thoroughly dry and without any ripples in the surface before cutting. I recommend spray adhesive as it will allow you to reposition the stencils if you don’t get them aligned perfectly on the first try. Save the die cut pieces to create raised images. step 3 - Roll out any scrap clay on a #1 setting of the conditioning machine or use a roller to flatten it to at least 1/8” thick. Step 4 - The images above are a good visual representation of positive and negative images. The (A) stencil consists of three layers of bonded card stock. It was pressed onto raw clay to produce the raised clay (B) image. Once this clay is cured you can use it as a texture sheet to make depressions in your clay project. The die cut image (C) consists of three layers of bonded card stock. It was pressed into raw clay to produce a depressed clay image (D). Once the clay is cured you can use it as a texture sheet to create raised images in your clay project. There are many instances where you will want to use both raised and depressed images in the same project. See my Leafy Bud Vase project as an example. step 5 - Shake baby powder onto a paper towel. Rub the wrong side of the paper image against the powder which will prevent clay from sticking to the card stock. step 6 - Place the paper image powder side down onto the scrap clay which will become your texture sheet. Feed both into the conditioning machine on the widest setting or use an acrylic roller to press the image into the clay. Three layers of card stock will produce a very defined impression. step 7 - Carefully remove the card stock from the clay. Trim the texture sheet leaving a border all around the image for easy handling. Bake the clay on pieces of card stock or cardboard at 275 degrees for 30 minutes. Allow them to cool completely. 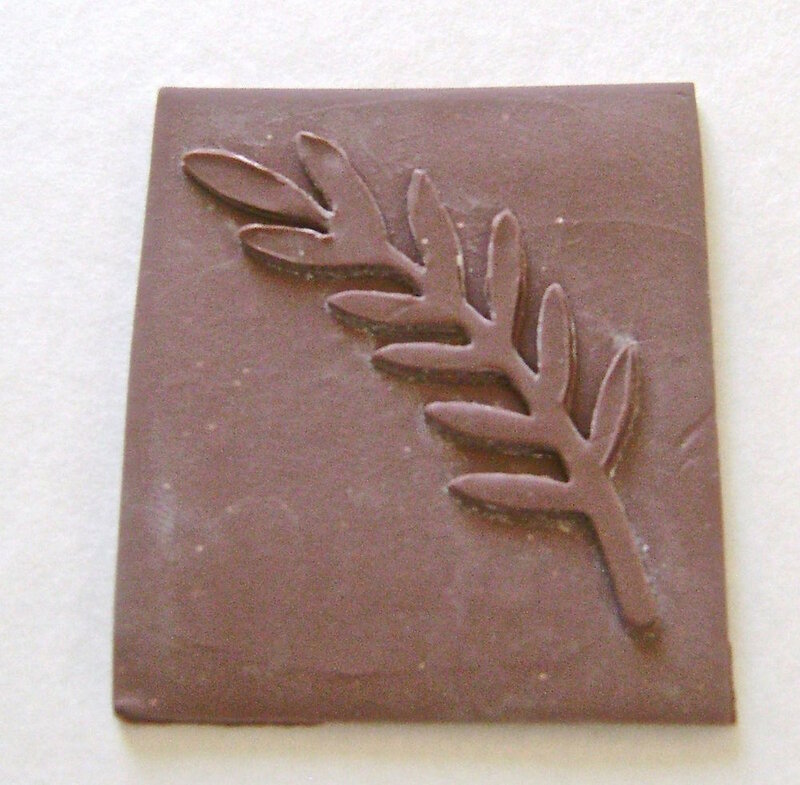 step 8 - Your new texture sheet will create raised images on your project as you see here with the raw green clay. step 9 - Keep in mind you can also use a craft knife to cut around the raised image to create a separate piece to be added to your project. Any texture sheet can be turned into a stamp by adding more layers and a handle. Go to Create Your Own Signature Stamps to see how. You can improve not-so-perfect edges by shaving the cured clay with a craft knife.